The men from Wetherby Road head into the fixture with a five-point cushion between themselves and the other side of the play-offs, knowing that a win could leave them on the cusp of securing a top-seven finish. “If we do our bit and other results go for us then we could have one foot in the play-offs by Saturday night,” Weaver said. “It’s another huge game and a win would be massive. First things first, we need to cement ourselves in the top seven, then, if we can make it, we want to be going into play-offs with momentum and a confident edge. “We’ve watched a fair bit of Boreham Wood. In terms of physicality, they’re about as big as they come, so if we try and go toe-to-toe with them in that sense we’ll come off second best. “What we have to do is build on the performance at Havant and make sure that we move the ball with pace and zip. Town will be looking to complete a league double over the Hertfordshire outfit having come from behind to win 4-2 when the sides met earlier in the season with George Thomson, Aaron Williams and Jack Emmett among the goalscorers. 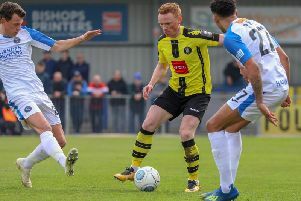 The Wood made it to the play-off final last term, losing out to Tranmere Rovers, but have struggled in 2018/19. They currently sit just two places above the drop zone, though they are unlikely to fall through the relegation trap-door due to holding a nine-point advantage over 21st-placed Havant & Waterlooville. Luke Garrard‘s team were beaten 2-1 at home by Sutton United last time out and their recent form is mixed. Their last 10 fixtures have seen them record just two wins, three draws and five losses. Justin Shaibu will likely be the visitors' biggest threat, leading the scoring charts with eight goals this term. Kick-off at the CNG Stadium on Saturday is at 3pm.